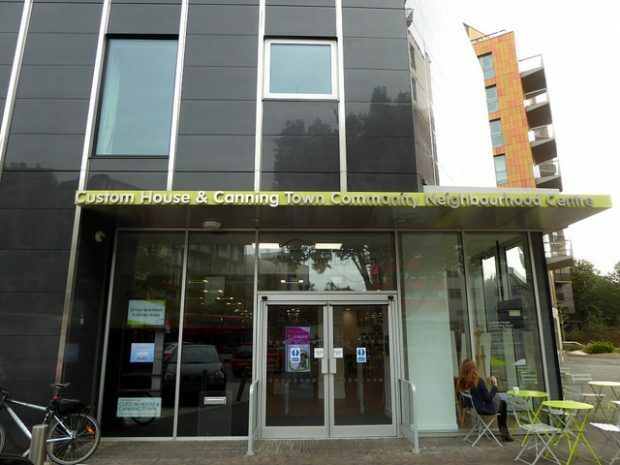 The 16th meeting of the Libraries Taskforce took place in the newly opened Custom House and Canning Town community neighbourhood centre - which incorporates Canning Town library. Members toured the new facility, which is a bright and welcoming space, with cafe in the entrance, more bookstock than the old library, and lots of spaces for relaxing or working. 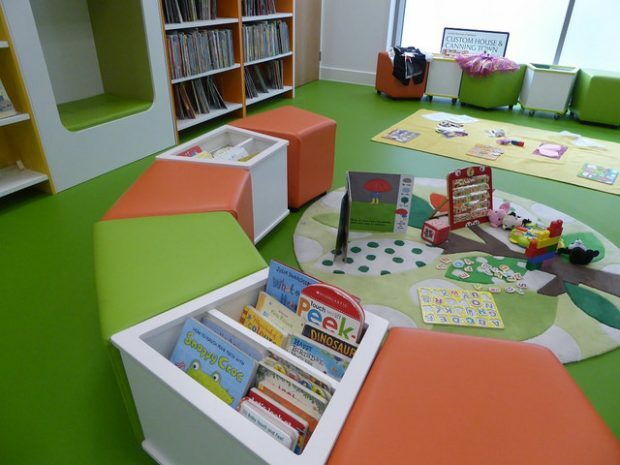 From the Amazon lockers in the entrance, to space for lots of pushchairs to be parked in the children’s section, it’s clear that this library has been designed with lots of input from what the community wants. There is a display of art from a local artist, comfortable chairs for sitting and reading, and book displays relevant to classes that were going on (health and parenting for one session, and material relevant to digital skills for Get Online Week). The opening hours are impressive: 8am - 8pm on weekdays, and 9.30am - 8pm on Saturdays. And besides the library space, the community rooms (which can be closed off as they have a separate entrance) are bookable until 11pm. Alongside the meeting rooms, there are a range of additional facilities for the community to use, including a kitchen and a treatment room for visitors who have special caring needs that go beyond the traditional ‘disabled toilet’ spaces usually provided. In the fourth of the meeting rooms we saw, a lively zumba class for over 50s was taking place, and we heard about seated exercise sessions, morning yoga sessions, and tea dances. Lots of activities which encourage people to get out and meet people and keep active, which contribute to meeting many agendas of social integration, reducing social isolation and loneliness, and improving health and wellbeing. When asked how the building name was decided on - and particularly why the word library wasn’t stated on the name plate over the front door - it was confirmed that the building wasn’t heavily library branded since conversation with the community had shown that many of the incoming communities within the borough were not familiar with the concept of libraries. This does not mean, however, that the traditional role of books and reading was in any way downplayed as part of the Newham offer. And, in fact, the figures we heard later during the presentation - visitors up, book borrowing up, participation in Summer Reading Challenge up - bear out the success of this approach in this community. Cllr Ken Clark, Newham’s deputy mayor and portfolio holder for Regeneration and Planning, Public Affairs and Building Communities, and Caroline Rae, strategic lead for libraries, gave a presentation which covered their vision and priorities, the services they offer and the events and activities programmes they run from their libraries. They described how they engage with residents, and the impact their services have had on residents. 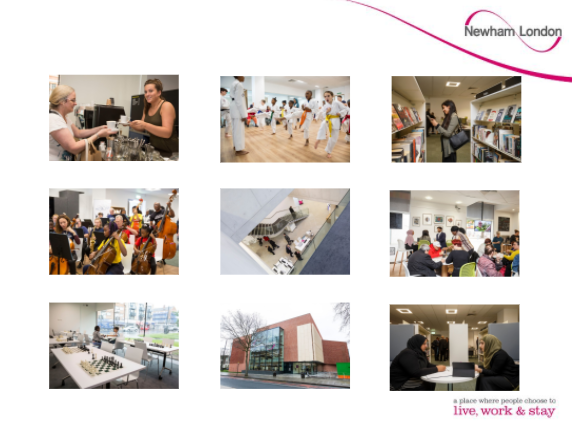 They focussed on Newham’s approach of library based community development, using the physical assets of libraries to act as a hub for delivery of a range of services, and to help develop and support hyper-localised community networks. We heard that, in 2011, Newham was the second most deprived council area in the country. Over 25% of households were living in poverty, and employment was at 55% - the lowest in the country. Plus there was a high percentage of residents with a language other than English as first language. The team knew they needed to look differently at how to serve communities. They recognised that all their neighbourhoods were different. So a plan evolved to develop community neighbourhoods - carefully planned, delivering specific interventions. They started with their libraries - acknowledging that they are the hearts of communities. Plans for activities are all done with the community, and the aim is for meaningful engagement. They mentioned lots of initiatives which fit into the catchy tagline of “every child a ….” or “every resident a …”. Schemes such as “every child a chess player” have resulted in 1,800 children learning and playing chess - 2 at national level. And not forgetting the tongue twisting: “resilient residents read”. Their approach to helping individual residents via libraries is exemplified in that each library has an adult social care link worker, who is able to find out what individuals want or need, and introduce them to the activities and services available. They have been described as the eyes and ears in the community. To reach their full potential, every child must be able to read. Their £1.5m Newham Reading Guarantee helps primary school children from five to seven years old to improve their reading. They support the teaching of phonics and pay for extra one-to-one support for those children who need it. They have recruited volunteers to help children to practise their reading and understand new words, and they work with Newham's libraries to support schools in delivering a reading and mentoring scheme. This investment is paying dividends. Their Key stage 1 results saw 7 in every 10 children achieve the expected levels in reading and writing in 2017. In 2016, Newham was ranked 4th in England on this measure for writing up from 138 in 2006. At Key stage 2: Nearly 7 in every 10 children met the expected standards in reading, writing and mathematics (67%) in 2017. In 2016 Newham was ranked 3rd in England on this measure for writing up from 132 in 2006. They also strongly promoted the Summer Reading Challenge, working directly with schools, (with 18,210 children subscribed locally and a 26% increase in children finishing the challenge) and were planning to hold their first word festival in November. Visitor figures have been rising since 2014, as have book issues. They are now seeing an 8% increase in book issues (year to date compared with year to date in previous year). This is the result of a lot of work being put into the importance of linking the reading offer with the activity offer, stock promotion and staff training. The final session where the Taskforce had the opportunity to look in depth at one of the Outcomes includes in Libraries Deliver: Ambition, was lead by the LGA’s Ian Leete, discussing how libraries support stronger, more resilient communities. It was acknowledged that this is really the culmination of the other 6 Outcomes, as had been extremely well illustrated during our presentation on Newham’s experience: activities related to health, culture, literacy and learning all help to build community cohesion. Councillor Mike Bell provided specific examples from North Somerset, where co-location with other community facing facilities, such as children’s centres, has unlocked wider, library-led, access to public services based on a focus on community cohesion, encouraging people to connect and maximise these opportunities. He mentioned that this approach has also enabled them to open a new library access point, where none existed before. The remainder of the presentation was given by representatives from the Department for Communities and Local Government (DCLG), who are working on producing a Green Paper on social integration during the autumn. They were working on a number of themes pulled out from the Casey Review focussed on combatting social exclusion, particularly in deprived areas. They have been taking an interest in the work already underway in a number of library services across the country to support and develop social mixing and trust between different communities - for example, work in Suffolk on their Chat and Chill sessions, and East Sussex’s work on Rhymetimes, bringing people from different communities - explicitly migrant families - together. The Taskforce discussed the critical issue of balancing tailored service provision to meet the needs of specific communities, with creating universal access to core services; balancing a more segregated and segmented approach with cohesion and universality. We agreed that library services were fundamentally committed to supporting strong communities - “it’s what they were born to do”, with the Ethics of Librarianship explicitly supporting equity, impartiality, and respect for diversity, equal opportunities and human rights . We talked about the role of libraries in building and reinforcing a sense of place, often as part of broader place-making partnerships, with the unifying benefits that this could lead to. We’ve had quite a few changes in Taskforce membership recently. Some replace previous members. Our previous meeting saw the departure of Brian Ashley (now retired). Paul Bristow, ACE’s Director of Strategic Projects, is standing in until a replacement Libraries Director is appointed. Rebecca Cox from the LGA has departed on maternity leave, and Alex Thomson will be covering for her from the next meeting. Helen Williams and Kate McGavin, who jointly cover the role of Deputy Director, Arts, Libraries and Digital Culture at DCMS (through a job share) have replaced Dominic Lake; and Polly Hamilton, Assistant Director, Culture, Sport and Tourism, Rotherham Council, has taken over from Iain Varah as the representative for the Chief Culture and Leisure Officers Association. We’ve also got 2 new members. One is Councillor Mike Bell from North Somerset, a member of the Local Government Association’s Culture, Tourism and Sport Board - the LGA Board that jointly (with DCMS) oversees the work of the Taskforce. We also welcomed Dr Neil Churchill, NHS England’s Director of Participation and Experience; given the increasing importance of building strong partnerships with health organisations, we are looking forward to his contributions and insights. 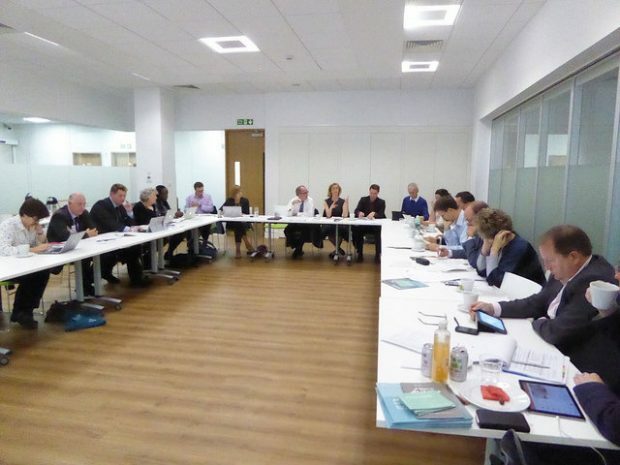 Canning Town was also the last meeting for our Chair, Paul Blantern, who, having departed as Chief Executive of Northamptonshire County Council, has also stood down as Chair of the Taskforce. The new chair will be Kim Bromley-Derry, Chief Executive of the London Borough of Newham - who was our host for this meeting. Our next meeting will be on 7 December in the new library in Chester: Storyhouse. It will take a slightly different format, as we will be focusing on the review of Libraries Deliver: Ambition one year after publication, and be refreshing the Action Plan and setting our priorities for 2018 (Ambition Action 24). We’ll also reflect on Taskforce ways of working to see what tweaks we might want to make in light of our new priorities.